I'm out of ideas and looking for help. I have a 2000 Jeep Cherokee that was gifted to me with the 4.0L Inline 6 motor removed (engine ran fine before removal) and all the components for a 4.6L stroker. I had the block machined and I assembled everything in the garage. I've spent many weeks checking and double checking everything I can think of to check but the Jeep won't start. The 2000 Cherokee uses one coil rail over all 6 plugs so I don't have plug wires I can connect sensors onto. The coil rail is known good because I swapped the rail from my other working Jeep into the project. I checked compression on all 6 cylinders and they were all within 105-120 psi (new machined block, pistons, and rings). I have checked the cam alignment with TDC of cylinder 1 on the compression stroke and it's aligned mechanically. I also used the scope to check the alignment of the cam and crank sensors, they look good (Cam Crank.jpg) to me. Measurements taken by back probing at the PCM connector. Yellow is the crank sensor and blue is the cam sensor. At that time the crank sensor was a new cheap parts store sensor. That resulted in the large pulse once every 3rd set and caused spark to be erratic and timing off (Bad Spark.jpg). 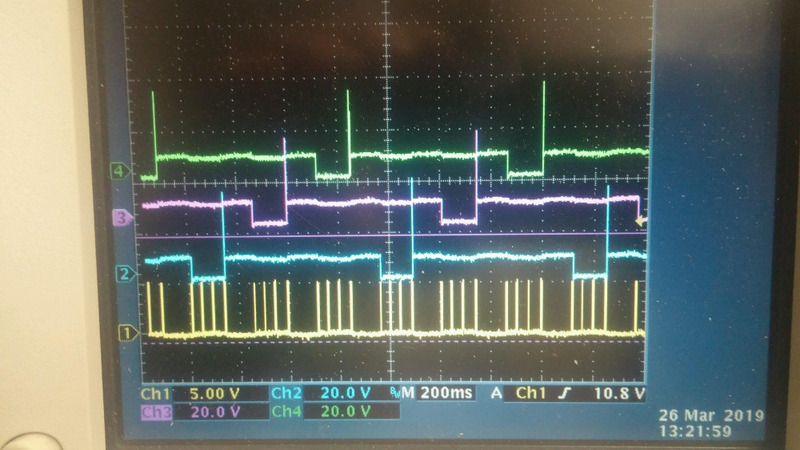 Again, all measurements taken by back probing at the PCM connectors. 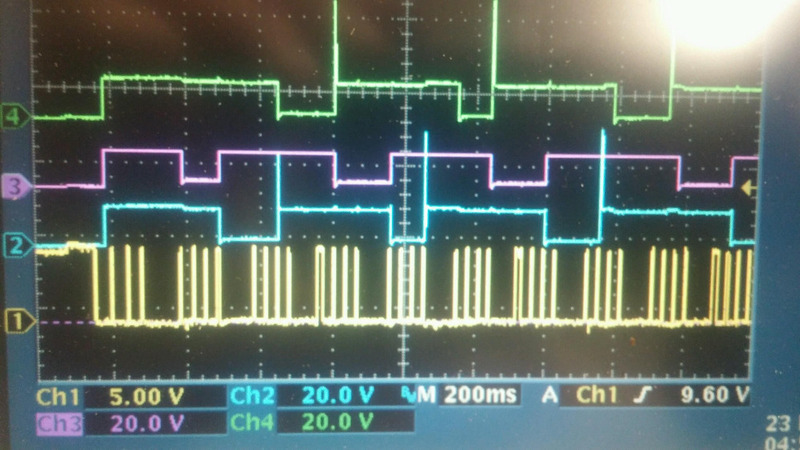 Yellow is the crank sensor and the other 3 signals are the PCM outputs to coils 1, 2, and 3. As seen, spark is out of time. After reading a similar issue with the crank signal on this forum I replaced the crank sensor with a Mopar sensor. The stronger magnet cleaned up the signal (Good Spark.jpg). I look at that and assume the spark event happens at each one of those positive voltage spikes. Since the trailing edge of the 4th crank pulse corresponds to 4* before TDC, that appears to be properly timed. With hope the Jeep would start we installed fuel relay, cranked, and it still failed to start. Thinking spark is good we moved onto fuel. We tried spraying a little starter fluid into the engine and it didn't start. We measured the injector pulses of the 6 cylinders along with the coil output from the PCM (Injector 1-6.jpg)(Injector 2-5.jpg). We did it for all 3 sets but I only took pictures of the first 2 sets. The last set not pictured look the same as injectors 2 and 5. I believe the probe on the "Injector 1-6.jpg" picture wasn't properly seated on that crank, later the coil signal was back to as shown in the other pictures (what I believe is normal). I believe the injectors "fire" when the PCM pulls the voltage down to 0. Looking at the injector pulses and they appear to be timed a little over 360* out of phase with spark for that cylinder. That would correspond to a little before the intake stroke and in my mind that's correct. So I'm looking at an engine that has decent compression, correct spark timing from the PCM, and correct injector timing from the PCM. But the engine fails to start. The next through was that the PCM is sending out good signals but that doesn't mean it's actually sparking or injecting fuel. Pulled the coil rail and plugs from the Jeep to find all plugs completely coated in fuel. Not good for spark but tells me the injectors are actually firing. With the rail off the block but electrically connected, plugged in all 6 new plugs, connected a wire to ground each one, and cranked the engine. All 6 plugs spark fire in pairs and appear good. As I see it has spark that's timed and injectors spraying at the right time. Even with brand new plugs installed, it still fails to start. Any ideas or help is appreciated because I'm out of ideas. Because i don't have known good waveforms, i suggest you to perform a relative compression test, unplugging all plugs, but leaving just one plugged (let's say #1). That way you can see a single hump due to current demand on starter and synchronize it with injector and ignition firing time. This let you know if visual TDC mark is aligned with the point of maximal pressure. Also if injector firing is in phase with intake stroke. On the other hand. Have you checked back pressure? 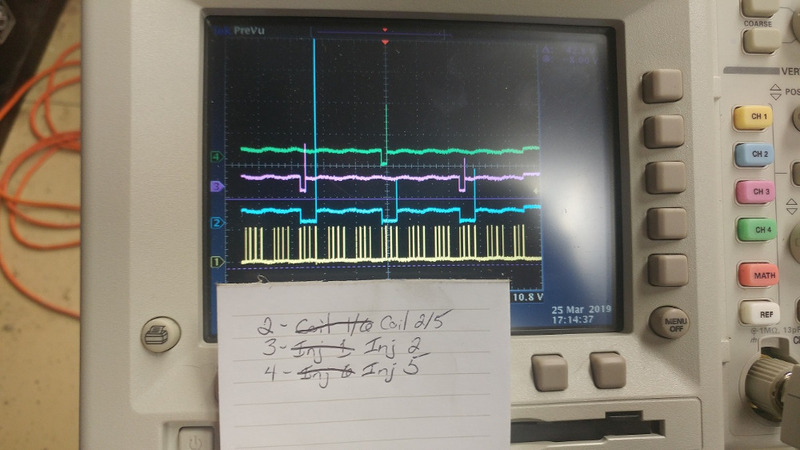 Also verify that the signal wires from the pcm to the coil/ignition module connect to the right pins and that the spark ocurrs somewhere close to TDC. I'll see if I can get ahold of an amp clamp to make that measurement. That would help verify some mechanical timing. Thanks for the suggestion. I haven't checked back pressure, but I'm sure it's not much. The exhaust was cut off just after the cats. So it's only exhaust manifold and Y-pipe. The exhaust is only the manifold and y-pipe (with cats). It should be free and clear. From what I've found in the service manual, the trailing edge of the 4th crank pulse occurs at 4* before TDC and it appears to me its sparking right at that point. To me that seems close enough (but I'm only a hobbyist). I still don't have amp clamp, then i pick up signal from battery voltage drops knowing that voltage is inverse to current, then you should observe valleys instead of humps. You can also pick up secondary ignition signal from a in plug coil system by turning a wire around plug cap (4 turns is enough) and the proper attenauted lead probe. About back pressure, (after cat means cat is plugged?) you must unplug cat (is this the one which gets clogged). Also you can just unplug upstream O2 sensor. I also second juergen.scholl suggestion. Look for data PID. If plugs are wet, you can have a extrem rich condition. Have you tried to start engine up at WOT? guafa wrote: I still don't have amp clamp, then i pick up signal from battery voltage drops knowing that voltage is inverse to current, then you should observe valleys instead of humps. While I only had plug 1 installed I picked up battery voltage, crank sensor output, injector 1, and coil 1. I didn't get a picture with all channels properly connected but everything seemed to correspond where I think it should fall (I also don't have a known good signal so I'm just going off what I think makes logical sense). 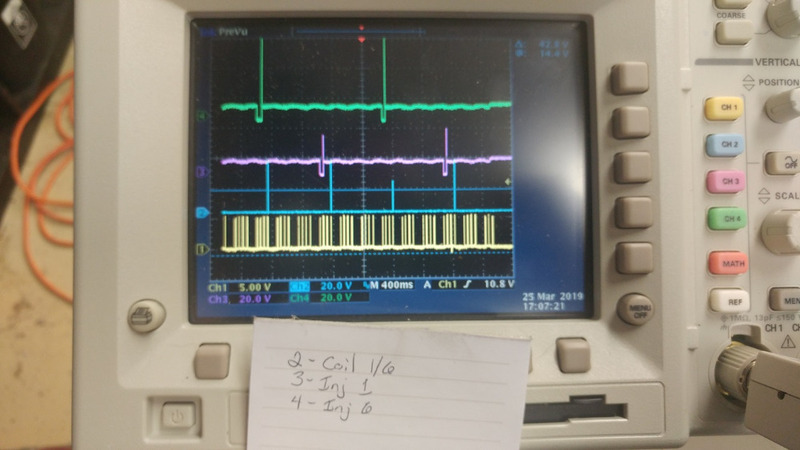 The attached file shows the battery voltage (green), crank sensor (yellow), injector 1 (purple), and coil 1 was supposed to be blue but I didn't have the probe in the connector far enough. 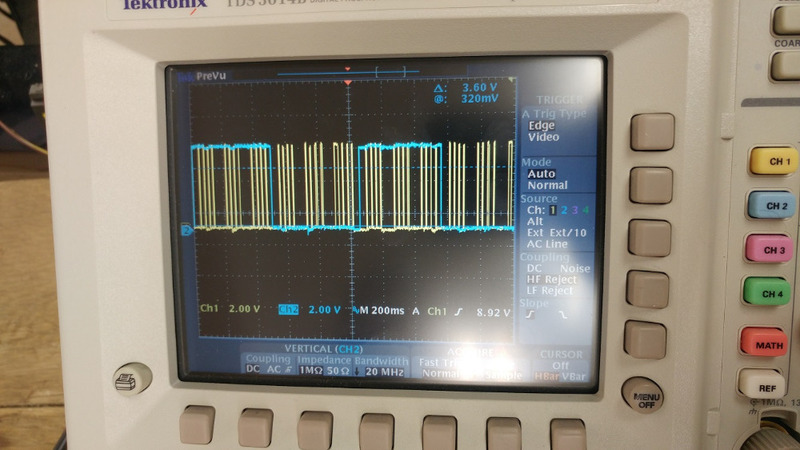 Once I did get a good connection it was the same signal shape as posted earlier and the rise from 0V to 12V corresponded to the dip in battery voltage. What I'm seeing is spark happening at maximum compression and injector firing a little over 1 crank revolution before spark/max compression. When thinking about it, I believe that's properly timed. guafa wrote: I also second juergen.scholl suggestion. Look for data PID. Can you expand a little on the data PID comment? I'm not exactly sure what you're recommending here. I don't have a nice mechanics computer/scan tool (I have thought about buying one but it's high priced for a hobbiest). The best I have it my phone, a blue tooth adapter, and the Torque app. I also have access to an o-scope for pulling signals. On the torque app I did find that when cranking the engine it'll read about 70 rpm, coolant temp is ambient, and throttle position changes if I move the throttle. I hooked up a meter to the MAP and measured at ambient, 4.8V. Then hooked a shop vacuum to the intake tube and voltage dropped to 3.8ish. I have tried starting it at WOT but that doesn't seem to help. It could be extremely rich so I pulled the fuel pump relay, let it sit overnight, and the next day tried to start it using only starter fluid (idea being injectors flooding the cylinders) but it didn't start. My understand is you should see at TDC a falling edge (12v to 0v) in primary ignition control line. That is the point where driver ends coil charge. I'm going to study a little bit more circuit and let you know. Just let's wait until expert guys here second my opinion. Here is my thoughts and what I've worked out (not saying it's correct, just my thoughts). I'm taking readings at the PCM connector. The circuit goes from battery to the coil rail (there's one 12V line on the connector). Inside the rail that line splits to the 3 coils, positive side. The negative of each coil goes out the connector and to the PCM. Essential the PCM is a switch on the ground side of the circuit. With the key in the on position the coil rail is getting a constant 12V through the 12V line on the connector. That 12V potential stays on the wire through the coil and to the PCM. But the PCM is acting as an open switch so there's no ground path, an incomplete circuit, and no current is flowing. So without a ground path, the pin at the PCM should read 12V (but if you were to measure current it's 0A). 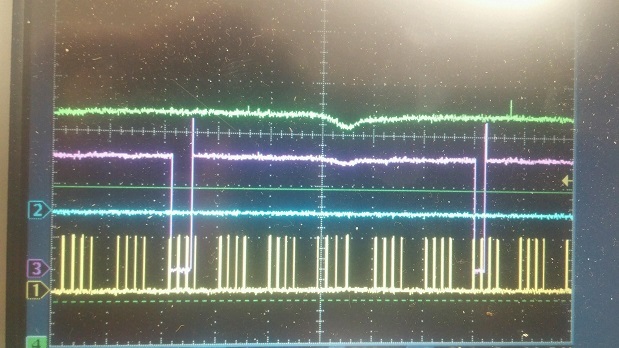 But when the PCM closes the switch, that pin drops to 0V since it's shorted to ground. Now that there's a complete circuit there's 12V into the coil rail, the coil provides the resistance of the circuit so one side is 12V and the other is 0V. The ground side leaves the rail, goes to the PCM where it's been connected to ground. With a complete circuit, current is flowing and the magnetic field in the primary coil builds. Once the PCM switches from a closed switch back to open, the circuit is no longer complete and current stops flowing. The pin at the PCM jumps to 12V just like in the original paragraph. But once current in the primary stops, the field collapses in the primary, builds the secondary, and then discharges through the spark plug. So spark ocurrs when the voltage of the primary coil (when measured at the PCM) jumps from 0V to 12V. something IS wrong with your engine. You have to do some CONCLUSIVE testing in order to discard or confirm problems. A plugged exhaust still is a possibility (you say exhaust was cut AFTER the cat), what does the map sensor show while cranking, any change at all ? 70 rpm while cranking is a very low reading it should be at least 150, better 200ish with a good starter and a well charged battery? Does the engine spin freely or could something be binding? Your Bluetooth scanner and the torque app will provide enough data to assist you a long way in this diagnostic quest, you just have to test at crucial points, not guess. Last edit: 01 Apr 2019 06:50 by juergen.scholl. JeepMe wrote: So spark ocurrs when the voltage of the primary coil (when measured at the PCM) jumps from 0V to 12V. The falling edge shows the beginning of the coil charging, primary circuit is now completed, current starts to flow and the magnetic field is built up. As soon as the ground is removed from the primary, the inductive kick - or flyback voltage - indicates the collapse of the magnetic field and this is when the spark actually occurs. Nice!! I'm clear now. Thanks. That means for me that with all signal synchronized and withfuel in cylinders, you have a breathing issue. By the way, performing test with relative compression you did, you can discard a lossen crank pinion or any rare mechanical issue. I have spent several time to realize that obvious is not so obvious. I guess that's why I'm here. I'm looking for help on what tests I should perform to find the problem. For spark I'm seeing good signal from battery to PCM (coil is in between). So I have an assumed good signal going to the coil rail. I don't have an amp clamp so I cannot measure the current draw. But I do know the coil rail is good. I have the project jeep and another jeep, both with the 4.0. I've swapped coil rails on the Jeeps and both work on the running jeep. So if there's good signal into the coil rail, the rail is good, and the plugs are brand new; what else do i test to determine in getting good spark? I think I have a spark tester I can try tonight. For the exhaust maybe it's clogged but how do you check it? There's maybe 2' of pipe that don't appear to have anything blocking them. When cranking you can put your hand over the exit and feel the exhaust pulses. When cranking the MAP sensor shows about 0.5V drop from not cracking. I don't know what good is so I used my running jeep. The MAP on both Jeeps read 4.9V at ambient. Then I applied a shop vacuum to the intake tubing on both Jeeps and both MAP sensors dropped to about 4.0V. I don't have a vacuum pump to apply a set vacuum to the sensor and measure at different points. But if a known good reacts the same as an unknown under a shop vacuum, that's a good indication it's working. The engine does spin freely. It was spun over by hand prior to ever cranking the first time. If it was binding I would expect to see a voltage drop in the battery when cranking (when I measured relative compression). Again, I'm not trying to guess on anything. I'm trying to perform the right tests to verify everything is working but I'm at a loss. If there's a test you think I need to do let me know and I'll try it if I have the tools.